A photograph of a PowerPoint presentation suggests that the "iPhone 8" Touch ID sensor module cutout is on the back of the screen —shedding some doubt on recent mockups and illustrations putting it underneath the display glass. 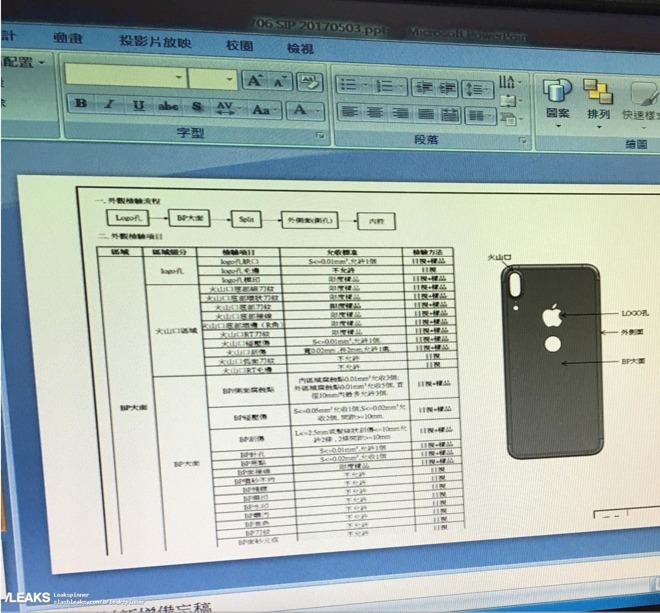 A picture posted to Slashleaks over the weekend harkens back to the previous alleged location of the sensor, about a centimeter beneath the Apple logo on the back of the case. The slide is dated March 3. The provenance of the image is unclear, and the Slashleaks community surrounding the leaked photo does not think highly of its authenticity. Another oddity from the image is the location of the camera flash. While the vertical camera orientation remains, there appears to be a case cutout for the flash underneath the module, as opposed to embedded between the two camera lenses. More recent diagrams and mockups suggest that there is no penetration on the back of the case for Touch ID. Obviously, at this point, nothing can be "confirmed" regarding the authenticity of this, or any other specific "iPhone 8" detail. The feature-rich "iPhone 8" is expected to launch alongside an "iPhone 7s" and "iPhone 7s Plus" in the fall. The "iPhone 8" is predicted to sport an edge-to-edge OLED panel with a 5.1-inch user space — the rest dedicated to virtual buttons. Slimming or removing the bezels would allow Apple to cram a larger battery into a form factor similar in size to the 4.7-inch iPhone 7. Also expected is a new 3D facial scanner . With a complete redesign, plus the inclusion of a 2.5D curved glass back with wireless charging, some reports have pegged the starting price of the "iPhone 8" at more than $1,000.